I've thought about writing a post on Breakfast Muesli many times. What holds me back is that I don't have the exact recipe to replicate the Bircher Yogurt Muesli from Melonhead in Coogee, Australia that this concoction is modeled after. I hold their muesli in such high esteem—and with such fond memories— that compromising it's greatness by producing a subpar imitation would be absolutely tragic. So for four years, I've made it, and never wrote about it. It was my own little tribute to my time abroad in Australia. But then I realized, you know what? This is REALLY good. And every time I make it, it's always really good. So even if it isn't just like the one from Melonhead (which it's not, because their yogurt is magical), it's definitely worth sharing. Muesli is a popular European breakfast meal comprised of rolled oats, nuts, and dried fruit. In Australia, they eat it like Americans eat cereal. While dry muesli is consumed in similar fashion to granola, fresh muesli is more like oatmeal; the oats are soaked in water or fruit-juice and then mixed with a dairy like yogurt or cottage cheese. This breakfast muesli encompasses every awesome breakfast meal in one. Fresh fruit & yogurt, oatmeal, and dried fruit & nut granola are all stewed together to create a creamy, delicious breakfast bowl sprinkled with crunchy bites of fruit and nuts. Because it is packed with so much energy—whole grain oats, protein-full yogurt, and filling nuts & fruit make a great start to the day—this amazing bowl of yumminess is also totally refreshing for a mid-afternoon power snack. I have to confess, sometimes when my sweet tooth is acting up, I even make it for dinner! As I said before, this recipe is by no means perfect, so feel free to take liberties with ingredient proportions and substitutions. Don’t love almonds? Try pecans or walnuts instead. Not into raisins? Swap for dried apricots or dates. There are a few ways to combine the orange juice and oats. One is to soak the oats in OJ for at least an hour (or overnight). For an added crunch, lightly toast the oats and nuts pre-soak. If you want a smoother muesli, more like a porridge, you can cook the oats in the orange juice: add half a cup of water, and microwave on medium-high heat for 3 minutes. Because this recipe is really sweet, feel free to eliminate the honey, dilute the orange juice, or half the dried fruit to cut down on sugar. I hope you enjoy this treat from down under as much as I do! Prepare oats (soak in orange juice for 1 hour, or cook in microwave per instructions above). 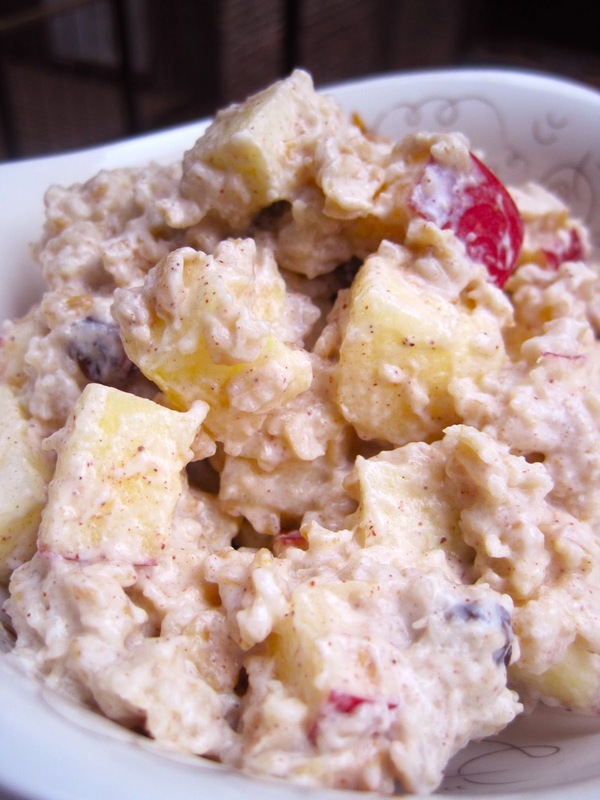 In a large bowl, combine diced apple, raisins, yogurt , honey, cinnamon, and nutmeg. Add oats. Mix thoroughly, and adjust ingredients per taste-test. Sprinkle mixture with almonds, and enjoy! Thanks for this post. I'm going to make some over the weekend and give it a shot. I've been looking for a way to switch up the monotony of my breakfast choices for a long time.